Today (Wednesday 25th March) saw the final session of Prime Minister’s Questions of the current Parliament take place. All eyes were on David Cameron and Ed Miliband as they began to debate some of the issues surrounding the election and their plans if they manage to form a Government in the next election. The main headline of today’s PMQs is that David Cameron unexpectedly pledged to not increase VAT during the next Parliament. This is significant because both the Conservatives and Labour have made the pledge, taking most of Parliament by surprise. Labour had been using the potential VAT rise as a line of attack against the Tories over the past few weeks. Even yesterday, George Osbourne refused to rule out of the possibility of the VAT rise when asked multiple times. Ed Miliband was clearly flustered by this answer, and perhaps the Conservatives came out on top when they turned the tables on Miliband to challenge his policy on increasing employment tax or National Insurance. However, Miliband refused to offer a straight answer about whether he would be increasing either of these after repeating probing by Cameron. Labour MP Hugh Bayley did raise an interesting point to rescue Miliband from complete embarrassment in his lack of response. He pulled out a newspaper clipping from April 2010 which showed a promise by Cameron not to raise VAT, however, this promise was broken and he rose VAT to 20% during the last Parliament. Which leader do we believe? Yet again, we don’t know because Labour refuse to commit suggesting they don’t have a sound plan on the economy and Cameron promises something which should’ve happened after the last election, but didn’t. 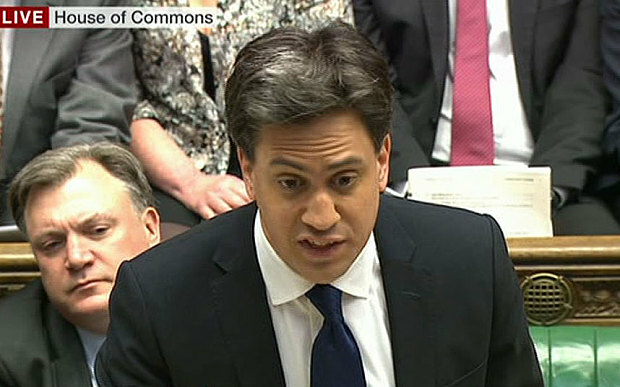 However, I commend Cameron for giving a straight answer and avoiding the usual politician’s question dodging. Much of PMQs also gave attention to the likelihood that SNP will be the kingmakers for the next Government and as David Cameron described, they are holding the whole Labour party hostage with ridiculous demands. He also made references to the demands of Alex Salmond if Labour were to form a coalition with SNP after the election. David Cameron remarked: “they now know they cannot win the election on their own, so they are preparing to answer the ransom note. Higher taxes, more borrowing, weaker defence, breaking up our union. That is what we’ve got to stop. Never mind talk of ducks, I’m looking at Alex Salmond’s poodle.” I very much agree with David Cameron here. Labour is carefully placing itself to negotiate a formal coalition, when in reality they should be focusing on preparing to win the election themselves. These comments today might swing a few more votes in favour of the Tories from the English voters. Much of today’s PMQs felt like the beginning of David Cameron’s campaign to win as many seats in the South England as possible. There was a large chunk of questions directed at Cameron from his own party backbenchers to recognise the progress which the Tory MPs have made in the South West over the past Parliament, for which Cameron began to attack the Green Party. There were clear focusing on addressing the issues of trains between Brighton and London, which have had some severe problems recently, and Cameron didn’t particularly give a solution to the problem. He instead chose to criticise the Green Party for not collecting rubbish bins, and urging the public to replace them with a Tory Council. The issues covered around the South West had very much varying degrees of success, but I’m sure there will be much battle ahead between the Tories and UKIP for the South England seats.